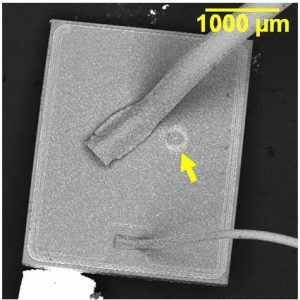 EOS Failure of Power MOSFET - SEM Lab Inc.
Optical image of HEXFET® Power MOSFET. Breakdown site is located near the source wire bond. The breakdown site is located near the source wire bond. This is a higher magnification image of the breakdown site. The breakdown current in amperes can be roughly estimated by the radius of the “hot spot” or breakdown site . The breakdown current is estimated at ~ 1 amp/1 mil radius. J. T. May, “Limiting Phenomena in Power Transistors and the Interpretation of EOS Damage”, in Microelectronics Failure Analysis Desk Reference, 3rd Edition, ASM International Press, 1993, pp. 321-328.